Take a look at the NBA schedule from Monday through Wednesday and some of the fun storylines to keep an eye on. Nuggets are off to an impressive 8-1 start. And they have done it without Isaiah Thomas, who spent two seasons in Boston from 2015-2017 and averaged almost 30 ppg during the 2017 season. Omri Casspi, who is averaging 6.2 ppg off the bench for the Grizzlies will apparently be awarded a ring from the Warriors on Monday, despite the fact that he only played 53 games with Golden State and was released in early April, before the playoffs. OKC forward Nerlens Noel was originally drafted by the Pelicans in 2013 NBA draft and was the 6th overall pick He was immediately traded on draft night to Philadelphia for Jrue Holiday, a deal that has paid off really well for New Orleans. Holiday is averaging 18.6 ppg and a career high (to date) 8.2 apg. Terry Stotts had had a highly successful run with the Blazers. In 7 years, he is 278-223 and has made the playoffs each of the last 6 seasons, but has gone 12-28 and has been swept out of the first round each of the last two years. Before being hired in 2012, he had a rough (less than) two year stint as coach of the Bucks, going 40-42 in his first year and was 23-41 when he was fired mid-way through the 2007 season. It’s all good in the end, as the Bucks are 8-1 and the Blazers are 7-3 as of Sunday night. 33 year old Jared Dudley is still going strong, now starting for the Nets in 2018. He returns to Phoenix, where he spent five full seasons over two stints, most recently from 2016-2018. He faces the Suns for the first time since an off-season trade involving Darrell Arthur, cap space, and cash. Best game of the day. Thaddeus Young is averaging 10 ppg and 5.5 rpg for the Pacers this year. He spent the first 7 years of his career in Phily, averaging 13 ppg and 5.5 rpg before the 76ers decided to trust the process and move on from some of their veteran players. 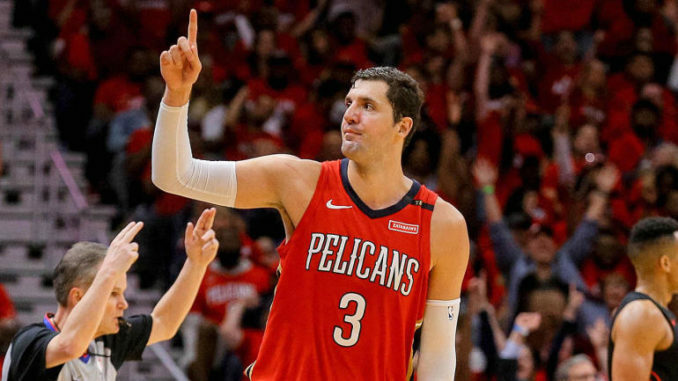 After spending the first four years of his career in Chicago, Nikola Mirotic is putting up career numbers in New Orleans. The big man is in his second season, but first full season, after being acquired last February. He is averaging 22 ppg in 30 minutes per game. His ppg average is up 10 points from his career average (12 ppg). He is also averaging 10 rebounds per game. Mirotic is a big part of the Pelicans offense. Many years later, this is a rematch of both the 2013 and 2014 NBA Finals. Not many players remain on the Spurs roster. Dwayne Wade is pretty much the only constant for the Heat, though he left and came back. Wade is averaging 14 ppg in his 16th and most likely final NBA season.